A lot of people are going to tell you that you shouldn’t get Rocksmith. “It’s too niche,” they’ll say. “It’s too hard,” they’ll say. “Music games are dead,” they’ll say. But here’s the skinny—Rocksmith is niche, is hard, and, for the most part, music games are dead. Aside from the fact that Harmonix is releasing new downloadable content for Rock Band 3 every week, there are no new iterations of it or Guitar Hero on the horizon. But Rocksmith isn’t a music game, per se, but it is aguitar game. “What’s the difference?” you ask? While music is the eventual result of guitar playing, there’s always a starting point. This game will put you at that starting point and build you up from there. It makes the guitar seem a lot less scary than the apparent nickel-wound-toothed monster that would generally look down on you in disdain from its perch on a shelf or a wall. Rocksmith breaks down the barriers for someone who’s interested in playing, but doesn’t feel like they have the time, patience or mindset to commit to learning. After spending a good chunk of time playing the game, I understand now what Paul Cross meant when he said, “It won’t teach you to play guitar, but you’ll learn.” Rocksmith, in essence, does not teach you to play guitar—all it does is give you a place to begin. That entry point for some is often an instrument and a music book, or an instrument and a tutor, but with Rocksmith, it’s an instrument and a game. Playing games isn’t all that intimidating, is it? In the interest of saving time, I won’t retread the same ground that was covered in the preview. I will say this about the game: You have to earn everything. All the unlockable guitars? Earn them. The effect pedals? They must be earned. Your potential future skill? You bet you have to earn that. And that’s the beauty of it. Apart from making the guitar seem a lot less scary, Rocksmith succeeds at doing what everyone can only dream of—it makes practicing fun. Practicing in itself is boring! I will tell you that outright as a guitar player. I hate practicing, and if you’re anything like me, you hate practicing, too. There’s no fun in practicing. Guitar teachers will tell you to practice your scales while watching a movie or spending time with your friends. Why? BECAUSE. IT’S. BORING. Rocksmith is a teaching tool disguised as a game to make practicing not so utterly dull. You’ll be able to play sections of a song repeatedly until you’re better at them using the Riff Repeater. The Accelerator mode of the Riff Repeater will take difficult sections of a song, slow them down to a pace you’re comfortable with and then help you get faster in quick succession. The Leveler, in turn, will let you take a section of a song, practice it at a lower level until you’ve perfected it and then raise its difficulty, improving your mastery of that section. A lot of people are going to be turned off by how precise Rocksmith demands you be—that’s okay, because the game DOES demand a great deal of precision. As forgiving as it might be in some aspects, your harmonics may not be as lilting as you’d like or your bends are just a hair under or over pitch to register, and you’ll do poorly as a result. You’ll get frustrated, you’ll be upset at the game and say, “HEY, I BENT THAT NOTE JUST FINE!” The problem is that you didn’t. That’s user error. Rocksmith has shown me just how imprecise my playing is; just how wanton my fretting, imprecise my bends and how bland my harmonics have been throughout the years. That’s a terrible feeling, but the best part is, I want to get better and now I have a way to do it without dumping hundreds of dollars into a tutor. The Guitarcade minigames are a godsend for disguising practice as fun. You’ll have a way to learn more precise bends thanks to the Big Swing Baseball. Chord knowledge will go through the roof thanks to Dawn of the Chordead and impeccably fun zombie shooting. Harmonics will resound better than ever with the Simon Says-like Harmonically Challenged. 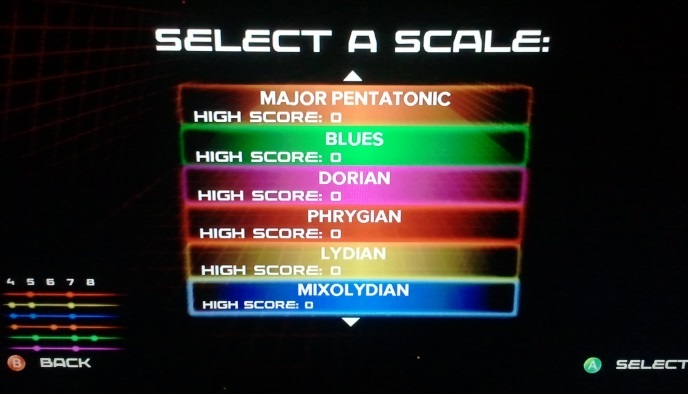 You’ll know what the differences in sound are between a Major Pentatonic, Mixolydian, Phrygian, Dorian, Blues, Major or Minor scales thanks to Scale Runner. “What do those mean?” I can’t really answer that without getting too technical with musical theory and terminology. The most important thing is that you’ll be able to recognize these things by sound and eventually be able to replicate music by ear or even create your own with gained knowledge. And you’ll be able to, because you’ll have the fundamentals to doing so. Rocksmith can never replace a human being as a teacher. It can’t tell you if you’re holding your pick wrong, if your posture is poor, or if you’re using the right fingers to fret a chord. But it will give you a near-complete groundwork with which to go from. And, above all, it will make practicing fun. If you’ve ever had an interest in playing guitar, already play guitar and want to get better, or are already a decent guitarist looking to work on your fundamentals and learn new songs, you owe it to yourself to get Rocksmith. To those that say the game is “too niche,” I think “wanting to play guitar” is a rather large niche that encompasses a great variety of individuals. If you’re looking for a great music game to play with several of you friends and have a good time, get Rock Band 3. 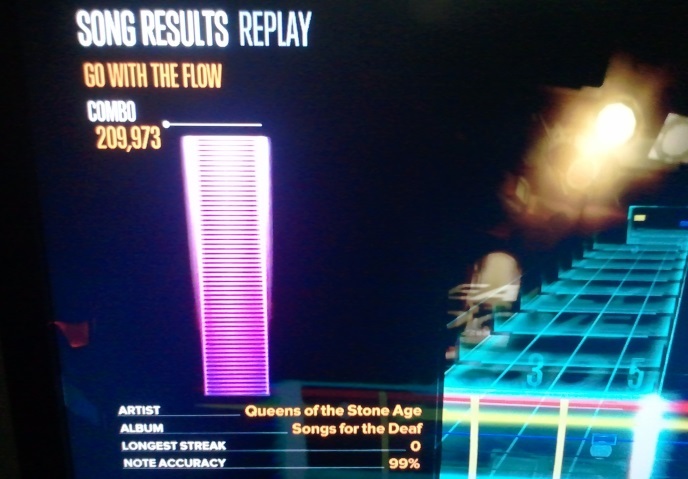 If you want the best guitar game available, Rocksmith goes up to eleven. Sadly, our scale only goes to ten. Rocksmith is currently available for the Xbox 360, PlayStation 3, and PC platforms.